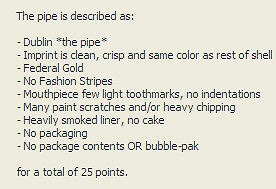 The value of pipe #264 is 25 points. Bruce Geary auctioned this pipe on eBay and I was lucky enough to win the bidding. It is a better example of this color/shape than I had in the collection so it replaces the former exemplar which goes on the Pipes for Sale page. Now that an even better exemplar has come to me, this one is now a pipe for sale. Firmin Oliveira bought it for his rotation.